If you can bake a cake, you can brew beer. And I’m not even talking an angel food cake, where you have to tiptoe through the kitchen as it bakes after combining the ingredients in exactly the right order in exactly the right way so the moody creation rises light and fluffy. Oh no, brewing beer is a lot more like throwing together a pound cake. You still need to follow the directions, but if you get a little extra vanilla extract in there, it’s not going to destroy the final product. Plus, you can listen to your punk turned up to 11 while it cooks. My friends Eryn and Ellen met Charles and me at Yolo Brewing Company this last weekend to brew some Belgian Pale Ale. Our group had done this a few times before at Yolo’s last incarnation, Brew It Up. In the past, we crafted an Orange Blossom Blonde, an Irish Amber, a Pilsner, and created our own brew using an existing Brown recipe and adding peppers to it. It’s a great way to spend the day, eat some pub-type food, and visit – all while creating beer that you get to take home in a few weeks. 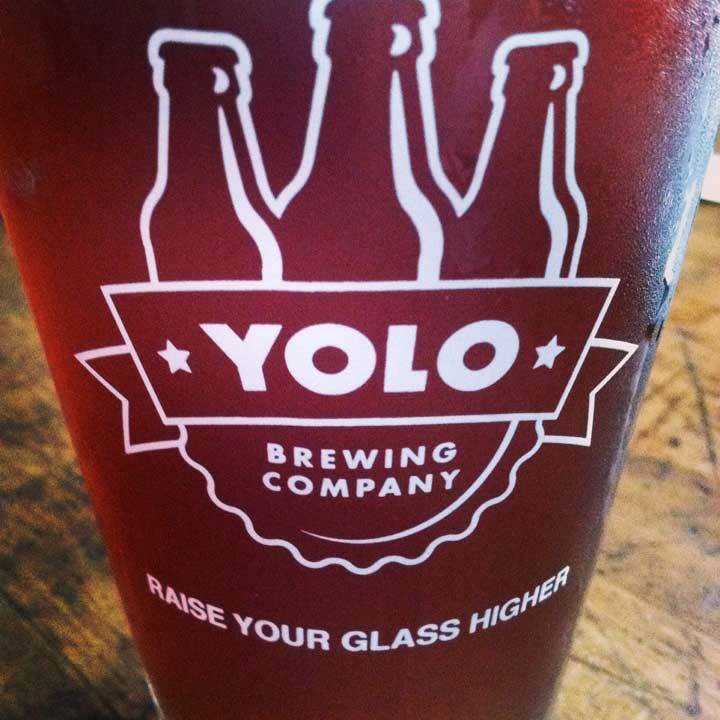 Yolo Brewing Company is located in West Sacramento inside a repurposed warehouse. The air is thick with the gorgeous smells of malt and hops as well as the tantalizing aromas of the dishes being offered up by the food trucks situated right outside the front doors. A brewmaster guides each group through the process of making grains, water, hops, etc. into beer. We were lucky to be assigned to Phil, who had also worked in the Brew It Up days and had years of experience to share with us. First, we got our grains. For our Belgian Pale Ale, that included Pilsner Malt, Munich, Vienna, Victory, and Carastan. Then we milled and mashed the grain. We ground the grain and put it into three bags, adding it to our kettle when the water was at 156 degrees F. The grains were steeped for 45 minutes and mashed every five minutes. To mash, you use a large, wooden paddle, stirring the liquid while carefully moving the bags around, a minute for each mash session. Then more heat was added to the kettle, until it reached 165 degrees. The bags were wrapped around the wooden paddle and squeezed out – well as much as was possible. Charles and Eyrn did an excellent job, and we should be treated to a little extra alcohol in our bottles thanks to their hard work. More water was then added to the beautiful copper kettle and heated to 180 degrees. After that, it was time for the extract! We used Brewers Gold Malt Extract. After measuring the proper amount, we set the pitcher of extract in a metal basket on top of the liquid in the kettle. The heat and steam quickly coaxed the extract into the roiling wort, and after a few minutes, it was time for hops! And there was our wort, beautiful and brown, tasting of roasted marshmallows. Because of the adjunct, this wort was sweeter than the ones we’ve tasted for previous brews. A heat exchanger cooled the wort, and was then ready to be pumped into our barrel. For the last step, our yeast was added – 1214. Once the wort had been inoculated with our happy, beneficial yeast, it was time to cap off our bucket and wait. For our Belgian Pale Ale, that wait is five weeks. The only beer we’ve waited for longer was our Pilsner. It’s so hard to be patient, but at the end of that time, we’ll return to bottle our glorious creation – all 12.4 gallons worth.